HI, My name is Lisa Guajardo. I have been teaching First Grade at Peavy since 2008. I love teaching First Graders. They love to laugh, have fun, and are eager to learn. They also tell the funniest stories! I never know exactly what the day will bring, but I know I can always count on a few hugs! I have lived in Hudson most of my life. I love being in a small town community and especially teaching in my hometown! I’m married to Rene Guajardo. We have 3 grown children, Gabi, Sean & Hannah. Just like children in my classroom, they are all very different. Yet each one brings something special to the family. In addition to our 3 kids,we have a dog named JAK! Jak is a Goldendoodle. He is already huge, but still just a puppy. And like most puppies, completely full of energy. For fun, I enjoy spending time with my family. We like going on vacations together, watching Texas Rangers baseball games, and just being together for good conversations. I am also very active in the children’s ministry at church and enjoy visiting with good friends. For alone time I like to read, listen to music, and try new recipes. When my children were in school, I wanted the same as you probably want. I wanted my child to learn, but I also wanted to know that my child was valued and loved in the classroom. So, please know I understand. I will love and value your child, just like I always wanted for mine. We are going to have a wonderful First Grade year! 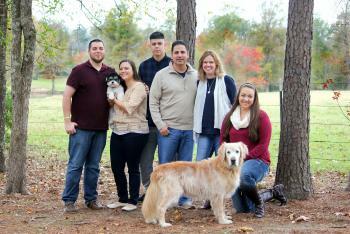 My family with our older dog Champ and my grandpuppy Maeby.